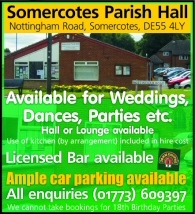 Somercotes Parish Council was formed in 1984 and covers the villages of Somercotes, Leabrooks & Pye Bridge. The Parish Council provide three allotments although these are not managed by the council, contact details for each allotment are shown on the allotments page. The Council also provides a monthly skip, this is available in the Market Place, Somercotes between 8am and 10am on the first Saturday of every month. The Council also provides street cleaning services, christmas lights and a number of grants to local organisations and events. The Parish Council office is inside the Parish Hall, the opening hours vary so please phone to check when we are open. Somercotes Parish Council publishes a range of documents online. The most recent documents are listed below.